with Harari & Johns, Ltd., London, 1986. Born at Albino, near Bergamo, the westernmost city of the Venetian terra firma, Moroni was strongly influenced by the Brescian Alessandro Bonvicino, il Moretto, with whom he worked in the late 1540s. While aware of wider developments - Lotto had worked for Bergamesque patrons to spectacular effect and there was a major altarpiece by Titian at Brescia - Moroni's consistency as a portraitist reflected his unquestioned dominance as the painter of a rich town with a powerful landowning and mercantile elite. Berenson termed Moroni the only mere portrait painter that Italy ever produced, and he was, indeed, the only major cinquecento painter who was first and foremost a portraitist, and whose enduring reputation is based almost exclusively on this achievement. To this extent, Berenson's implied analogy with Frans Hals, although not intended in a complimentary sense, is not misplaced. 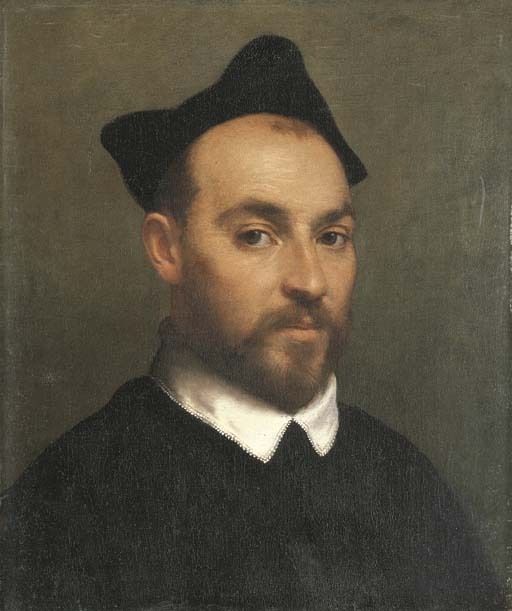 Partly because of its small dimensions, this previously unpublished Portrait of a priest stands as a fine example of the intimacy and directness of observation that distinguishes Moroni from his more courtly contemporaries and constitutes his contribution to the tradition of realism in Lombard painting that a generation later would inspire Caravaggio. As suggested by Prof. Mina Gregori (written communication, April 2002), the present lot is a late work by the artist. It can be compared to other small-scale late paintings by Moroni from the 1570s, such as the Portrait of a nobleman (sold, Christies, London, 7 July 2000, lot 85), as well full-lengths such as the celebrated Cavalier in the Isabella Stewart Gardner Museum in Boston. The treatment of the hair and flesh in the present lot closely parallels that in the Gardner canvas, a work dated 1576, and the Portrait of a Young Priest, an austere and somberly colored three-quarter length in the Pinacoteca dell'Accademia Carrarra, Bergamo, which is generally dated to the 1570s. We are grateful to Prof. Mina Gregori for for her assistance with this entry and for confirming the attribution of the present lot to Moroni.